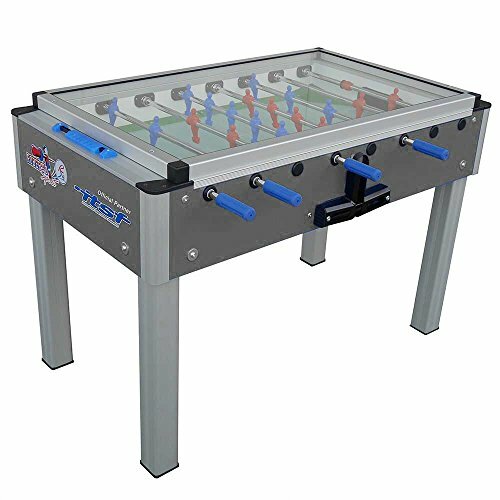 Elegant and solid soccer table with anodized aluminum legs. Sturdy, laminated body. Telescopic rods (which do not come out of the table) make game play safe for players of all heights. Telescopic rods (which do not come out of the table) make game play safe for players of all heights. Anodized aluminum legs. Feet are made of a special soft plastic material that ensures adherence to the ground. 5 mm tempered glass playfield. Goal slits are situated at two sides for the ball recovery. 18 mm rods with extra soft rubber handles. Silk-screen printed headboards with logos of Roberto Sport and ITSF (International Table Soccer Federation). Covered playfield stops ball from flying out of game area during those intense games! International Trim: Rounded Player feet and sandblasted playfield glass. 2 year, bumper to bumper warranty.